In a recent series of papers, Fred Bergsten and Joe Gagnon (also affiliated with the Peterson Institute) come to a very different set of conclusions about the currency manipulation by a group of about 20 countries, including China. Gagnon has shown that there is a near 1-to-1 relationship between currency intervention (official purchases of foreign assets) and the accumulation of a large current account balance (trade surpluses). Bergsten and Gagnon estimate that eliminating currency manipulation could reduce the U.S. trade deficit by $200 billion to $500 billion per year. I have estimated that elimination of currency manipulation could create between 2.3 million and 5.8 million U.S. jobs. Bills have been introduced in the House and Senate, with broad bi-partisan support, that would modernize the standards use to define and tighten the laws available to respond to currency manipulation. Gagnon concludes that large, persistent current account surpluses would not have been possible without the support of “massive official net purchases of foreign assets.” Those purchases are the “elephant hiding in the room,” that have been ignored by economists such as Kessler and Subramanian, and by U.S. Treasury officials since the Clinton administration, who have refused to label China as a currency manipulator. 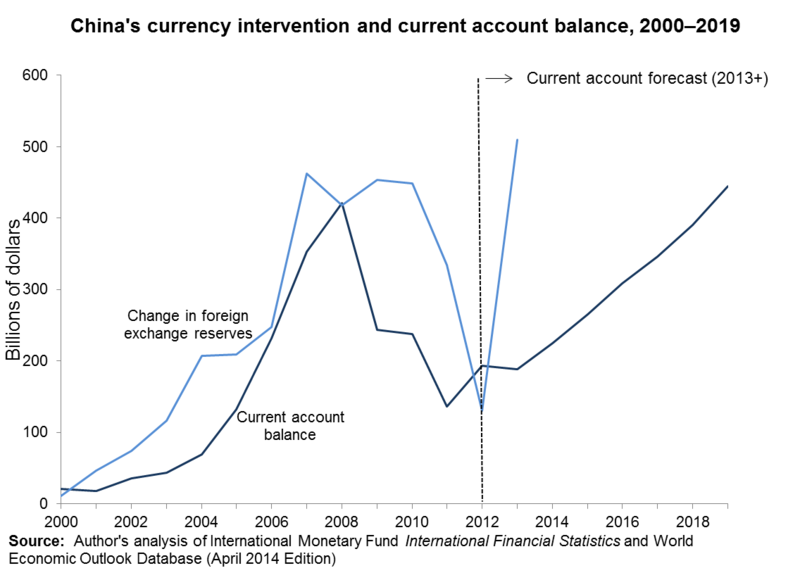 China is by far the largest currency manipulator, and there is tight correlation between its currency intervention (as indicated by the growth in foreign exchange reserves held by China’s central bank, as shown by the blue line in the figure below) and its growing current account (trade) surplus (solid black line in the figure). Since 2000, China’s central bank purchases of foreign exchange reserves have steadily increased along with its trade surplus, with the exception of the period following the Great Recession, from 2010-2012. China’s purchases of foreign exchange reserves surged to a record $508 billion in 2013, and China has purchased over one hundred billion in reserves in the first quarter of 2014. The IMF projects that China’s global current account surplus will increase in 2014, and will rise steadily for the next five years to over $440 billion in 2019. The United States is the largest target for China’s exports, and we lost 2.7 million jobs due to growing China trade deficits between 2001 and 2011 alone. But for China’s purchases of foreign exchange reserves, the renmimbi would have risen significantly. In fact, its value declined 2.9 percent between December 2013 and May 15, 2014, thereby reducing the cost of Chinese exports when measure dollars and other foreign currencies, and raising the cost of U.S. exports to China. There is no doubt that China’s currency is undervalued. China has spent over $600 billion in the last 15 months just to keep it from appreciating. It’s time to end currency manipulation by China and other countries, and to rebalance global trade.